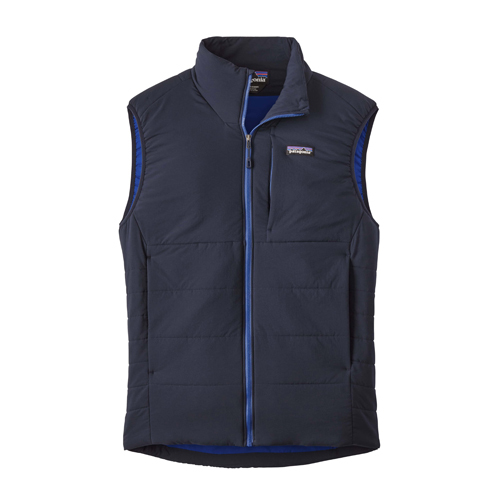 The Nano Air Vest by Patagonia is perfect for layering on chilly days in the mountains or just around town. Sun-warmed rock down low, icy runnels up high: sendin’ temps. Whatever your preferred medium, core warmth matters, and our Nano-Air® Vest keeps pace throughout high-output, stop-and-go missions in variable conditions. Its stretchy and highly breathable fabric package integrates the qualities of fleece, soft shell and puffy. Our warm-when-wet FullRange® insulation is sandwiched between a plain-weave liner and a lightweight, weather-shedding nylon ripstop shell, which we’ve improved for durability. All of which means you can put it on and leave it on. The soft, supple feel and full mechanical stretch makes for a close, updated, athletic fit over baselayers and an uninhibited range of motion. The left-chest pocket and two handwarmer pockets all close with trim, low-bulk zippers. The center-front zipper has a storm flap and zipper garage, while stretch binding at the armholes and a dual-adjustable drawcord hem seal in warmth. The vest has a DWR (durable water repellent) finish.